Since 2003 the Music is Art Festival has been a free event highlighting the artistic talents of individuals and groups from within our Western New York community. The Festival has become Buffalo’s most extensive exhibition of local art, dance, and music. The Festival draws over 20,000 throughout the day to be entertained by this multi-sensory event; part concert, part bazaar, street fair and art gallery. The Music Is Art Vendor Village hours will be as follows, Saturday Sept. 8th from 11am to 2am. Your business will be assigned a location to set up. Electricity is provided. Tables will be available for vendors who need them. Vendors will be responsible for bringing any other items needed. Vendor fees are non-refundable. All fees must be paid in advance of the event. 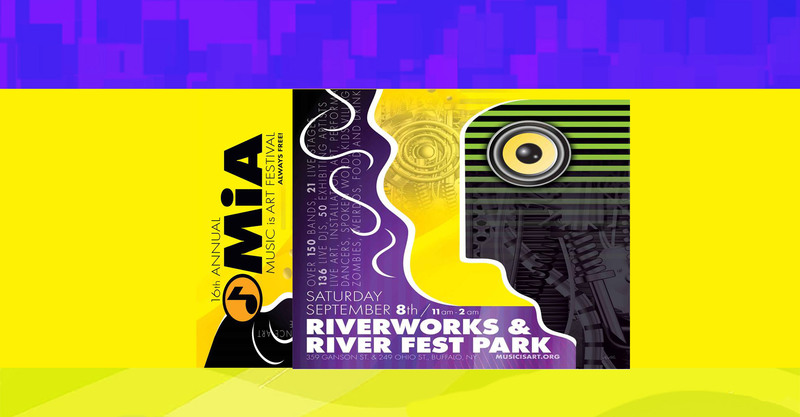 Buffalo Riverworks or their affiliates will not be held responsible for any liability, lost or stolen or damaged merchandise or any injury incurred during the Music Is Art Festival. All vendors assume complete liability and responsibility for their participation in the event. Each vendor must clean up their area at the end of the event Event will be held rain or shine. Each vendor reservation received will be confirmed via email. Vendors are responsible for their own personal property and are responsible for maintaining compliance with any and all codes and regulations. Please Make Checks payable to “Buffalo Riverworks.” Questions, call Sean Green at 716.342.2292 or email at SGreen@BuffaloRiverworks.com Mail or drop off completed form along with payment to Sean Green c/o Buffalo Riverworks, 359 Ganson St, Buffalo NY 14203.